here’s a quick tutorial to help you out. 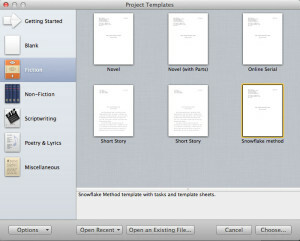 Open Scrivener. 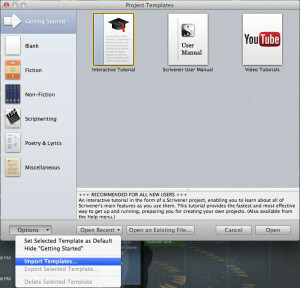 You should see the Project Templates window (screenshot below). If you don’t see it, go to the File menu and select New Project. 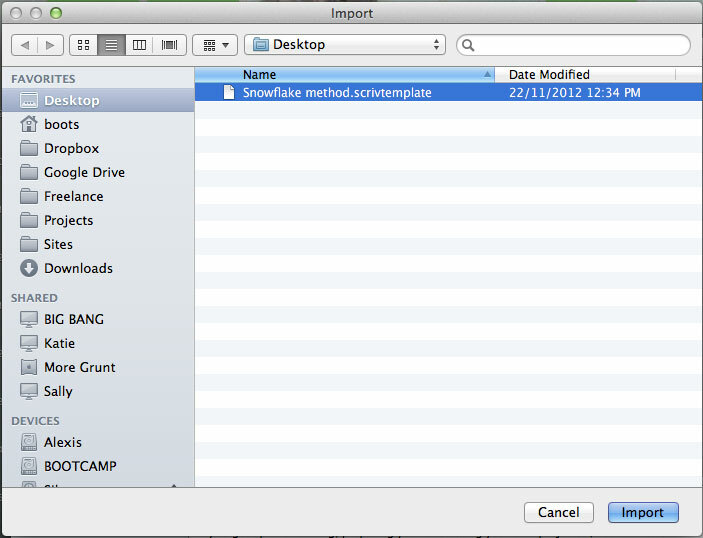 Click the Options dropdown, in the bottom left-hand corner of the Project Templates window, and select Import Templates. 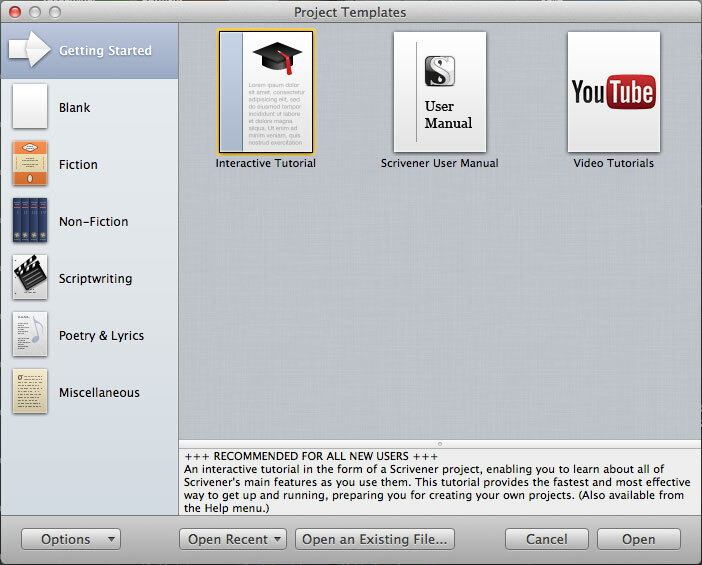 Select the Scrivener template you want to open and click Import (in the bottom right-hand corner of the window). Select the appropriate category (Blank, Fiction, Non-Fiction, etc. 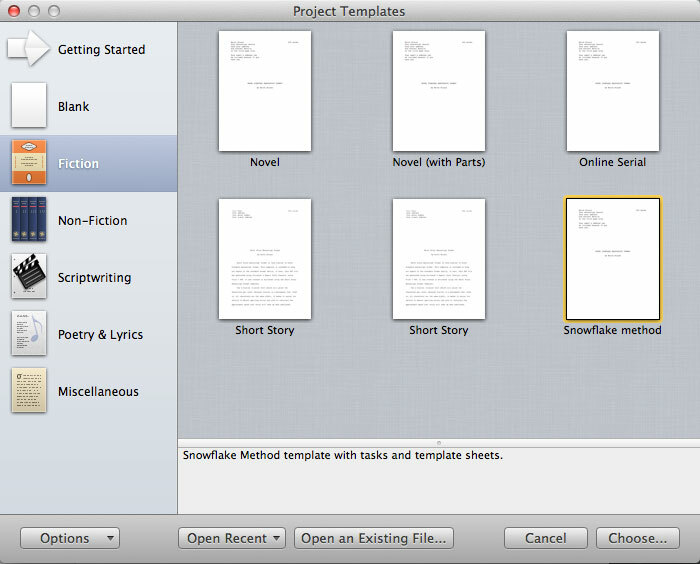 The Snowflake template is listed under Fiction.) in the Project Templates sidebar. Double your new template, or select it and click Choose, and you’re done! Thank you for this tutorial!! I was making it way too hard for myself! Not a problem 🙂 I hope you find the template useful! Thank you very much for this! I’m struggling with my second draft now, and I think I’ll give this a shot. My pleasure, and good luck with your second draft! What’s your novel about? Downloaded Species template, followed instructions but template greyed-out so consequently cannot import it. Any ideas? If you downloaded the Species template sheet, it will be in a Rich Text or MS Word format, which you will need to copy and paste into a Scrivener document. Does this work in existing projects or can it only be added to new ones? A template can only be applied to a new file. However, if a template has parts that you would like in your existing file (such as a character template or even a whole section, like Research Notes or Worldbuilding) you can select them in the template Binder and drag them across to the Binder in your existing file. Got me curious, I bought your book. Thanks for the scrivener help. Hi Marc. Great to hear you found the post useful and I hope you enjoy Hero! 2. 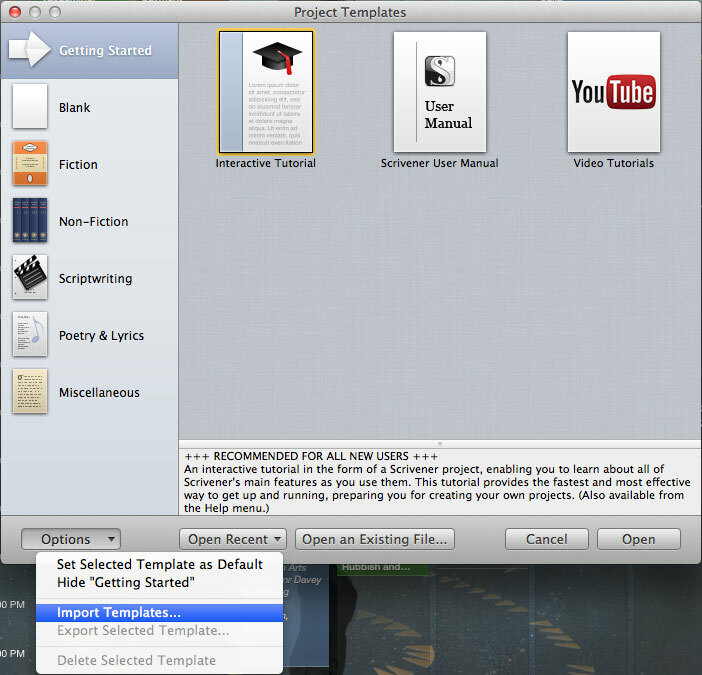 Find a Scrivener white paper template – Google says go to Belinda. GOT IT! I’m trying to open a template that is in my downloads folder with the file extension “.scrivtemplate” When I go to the “file/newproject/options/import templates” dialogue box the file browser does not see this file in the downloads folder. My understanding is that this file has been downloaded and installed successfully by many others and stores itself in the non-fiction section of the templates window. It is a valid template file and not a text file. I’m using Windows 10, the file was created using ios. Is there anything I can try to make this file visible so that it can be downloaded? please ignore above question. 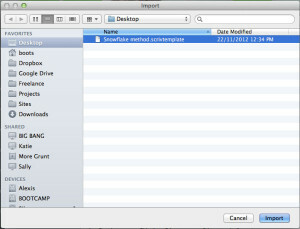 I copied the file from the downloads folder to the desktop and scrivener was able to see it from there. I’ll chalk this up to yet another unexplained windows 10 glitch. Does this work with a iPad? I am having issues with the zip files. 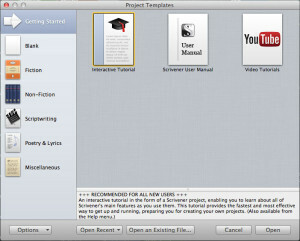 No, the templates don’t work on the iPad version of Scrivener. You have to open with the desktop version. I can’t believe I didn’t find something so useful before! Finally a Scrivener template that has everything I need- I never even though of having objects and history be folders within Scrivener itself before! I love this and thank everyone involved in building this.